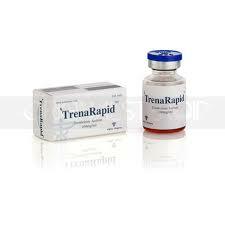 TrenaRapid is a strong-acting steroid for gaining muscle mass produced by Alpha Pharma (India). Previously used in animal husbandry to improve digestion and weight gain in animals. Acetate is in high demand among consumers, despite the fact that this volatile liquid does not have a duration of exposure. Trenbolone, on the contrary, has this property, and this is achieved through reactions, which result in the formation of complex volatile liquids. Mainly used as an aid. Because of its strong effect due to the interaction with the steroid hormone receptors, it is necessary to strictly follow all instructions for use, as well as additionally use the necessary drugs to eliminate side effects, including after the cessation of its use. TrenaRapid, produced by Alpha Pharma, fully promotes muscle tissue growth and strength. One of the features of the steroid is the lack of chemical reactions for the conversion of testosterone to estradiol, which leads to the exclusion of problems associated with the difficulty of outflow of fluid and an increase in the mammary glands. Fat deposits in the body turn into muscles, the volume of which increases noticeably (in two months you can achieve an increase of up to 10 kilograms). Increases strength, increases resistance to stress and increases libido. Increased growth hormone secretion and significantly increases the growth of cells and tissues of the body. At the end of the application of TrenaRapid, namely after 14 days, it is necessary to restore the body’s functions with the help of Clomid and Toremifen, which reduce the negative effects of the former. Remember that the action of Tamoxifen is the opposite of the above drugs, and its use only hurts.